As stated in the Fix’s previous post, “Fixing a Fold-Out Plate” fold-outs are commonly used to feature important illustrations and diagrams in books. Unfortunately, they are also common sights in book conservation labs, as they are frequently damaged in the process of folding and unfolding into and out of the book. Recently a book with a uniquely large (and damaged) fold-out illustration that was in the process of being digitally scanned for the Biodiversity Heritage Library came across my workbench. Its size is certainly noteworthy, and the end result after treatment and digital scanning will allow library patrons to easily access and view this cumbersome and fragile item online and do so without harming the fold-out plate. Many nineteenth century books are printed on very thin and embrittled paper and their fold-outs plates cannot be unfolded without damage. Even after conservation treatment, these illustrations cannot be served as originally conceived in this format owing to the unusually large size. 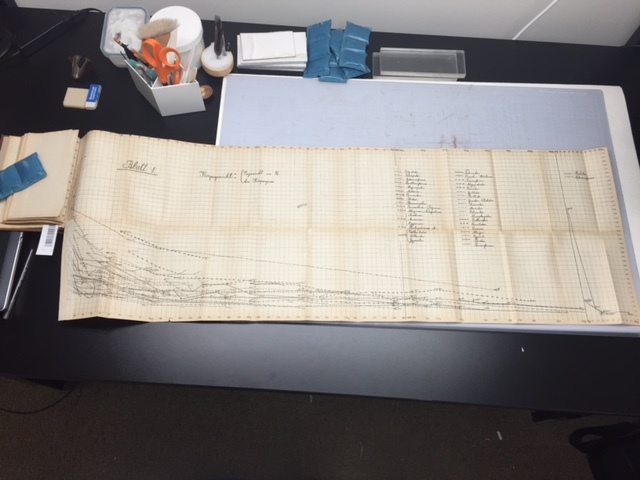 A nearly four foot long foldout! Note in this picture that the light blue, self-healing cut mat measures 24 x 36 inches. This fold-out is about 4 feet long! The paper was very thin and brittle and showed tears along most of the creases (there are 33 crease points). There really is no practical way for any Library patron to use this material, even after treatment. The greatest problem for the fragile paper is that this fold-out diagram can be terribly difficult to unfold and refold neatly. Digitizing books with these challenges offers a solution for Library patrons to access these fragile materials. 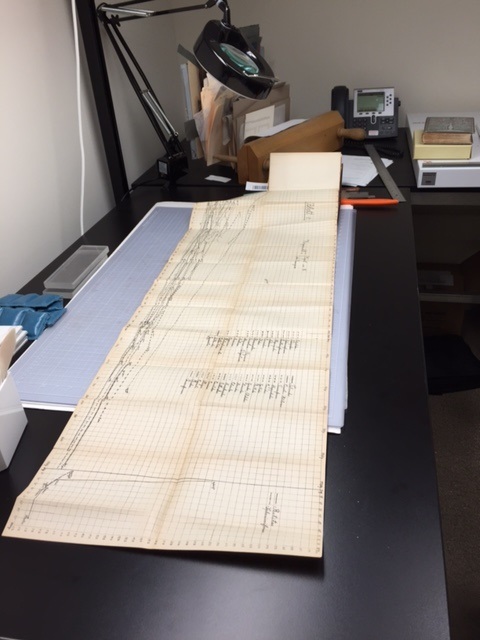 The Smithsonian Libraries Preservation Department works closely with the Libraries’ digitization efforts. Conservators review, stabilize and repair books and manuscripts before, during and after the digitization and scanning processes, as needed. This particular foldout has been carefully mended and stabilized, and will be photographed for the scanning process on a large flat table. The end result will be an image that can be easily accessed and used by researchers. Our digital collections include over 27,000 digitized books and manuscripts available on our website that include photo and illustration collections, seed catalogs, trade literature, and much more. Browse the Galaxy of Images and see if you can spot some of the many foldout illustrations that have been scanned. Detail of first and last sections of the fold-out chart pre-scan. 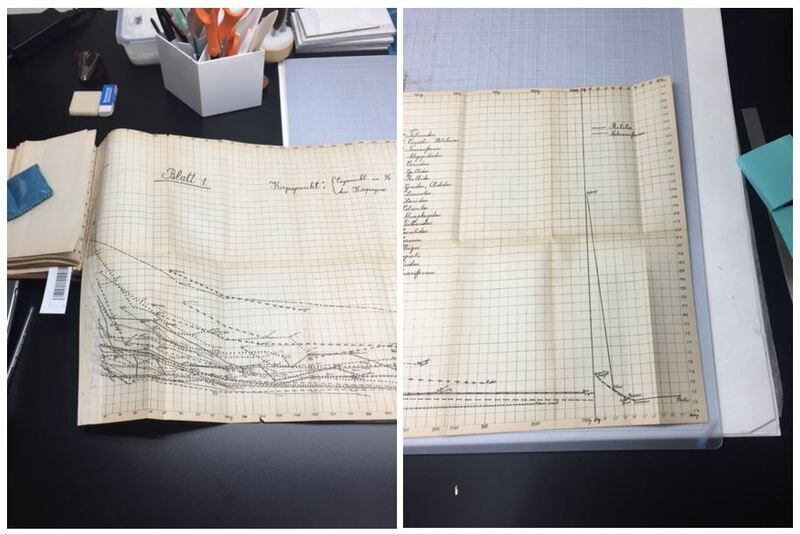 Previous Post Welcome, Field Book Project interns!